Monday, March 18, 2019. San Jose, CA. Today is the start of the NVIDIA GTC which is a yearly gathering modeled on the larger Siggraph conference and with a specific emphasis on graphics and graphics processing. With the rise of deep learning and artificial intelligence, NVIDIA felt that a separate conference was the best way to share information, create a space for communication and to promote their technology. This is my third time attending the GTC and attendance has grown by leaps and bounds. Today's keynote (always a fun event) by NVIDIA CEO Jensen Huang had to be moved to a much larger space at the nearby San Jose State University. The place was filled to capacity and Jensen’s talk was streamed live. You can check out the event on NVIDIA’S Youtube channel when it is posed which will be very soon. NVIDIA does a good job of improving the GTC every year. 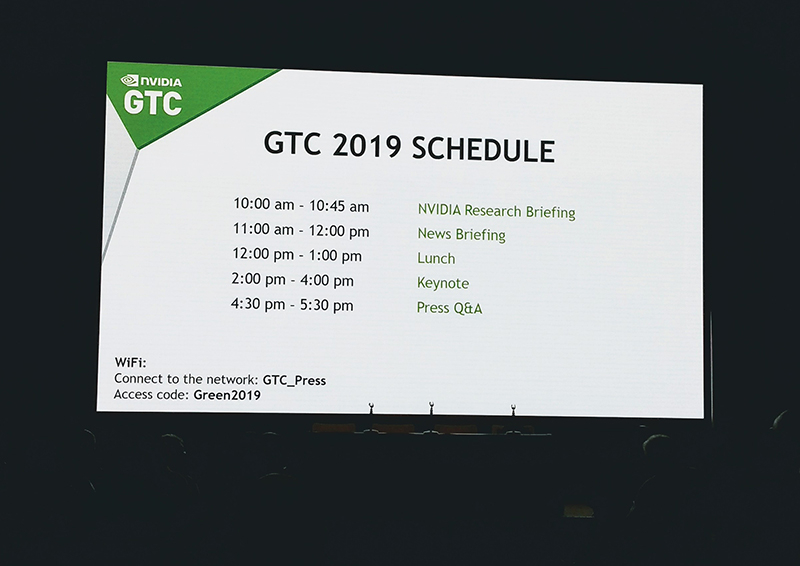 This year they offered a pre-briefing for the press which took the form of two presentations: an outline of what the NVIDIA research department is doing from Bill Dally and a quick overview of the announcements that Jensen will make in his keynote. Four heads of departments covering the keynote topics spoke about what was going to be announced. I was impressed with the thoughtful approach NVIDIA research has to organize its time and focus. You know a presenter is doing a good job when you want to go to work for them immediately after the presentation. Bill Dally, the presenter, is awesome. One part of the research presentation that blew me away was an experimental application for creating photo-realistic scenes using ai. Think Vue but using a tablet to sketch the scene while the ai uses a photo dataset to transform your dinky sketch into a beautiful scene. The project is called GauGAN and it’s being developed by Min-Yu Liu and Bryan Catanzaro as a future rendering technology. NVIDIA also announced demos for three fascinating uses of neural networks. They have a separate page called the “AI Playground” at NVIDIA where you can play with the demos live. In one of the demos you can take a picture of yourself (or anyone) and the network will generate new synthetic faces based on your model. This is called the Photoreal Image Synthesis demo. It’s amazing so check them out. Although Jensen spook for over two hours combining mini-lessons in contemporary computer graphics technology (he’s a great teacher) and announcements of new NVIDIA projects/products, I’m going to focus on the news that I think is most relevant to Renderosity Magazine readers. The Cuda-X Library. NVIDIA has been growing deep learning/ai technology by creating free, open-source libraries for scientists and students to use in creating their own datasets and applications. So much so that the demand has skyrocketed. It’s NVIDIA giving away technology tools so that others can expand on them and develop on their own. The Cuda-X library is NVIDIA’S effort to bring all of these tools into one place. NVIDIA Omniverse. Increasingly, digital artists are being hired from around the world and are sending in their work via the internet. NVIDIA has created a gpu-accelerated platform for artists in different locations to work together in real time on a specific scene. This solves the problem of not knowing what another artist is doing when you work on the same thing. The demo Jensen showed was amazing. Virtual workplaces are a very big thing and I think there will be a lot of interesting in NVIDIA’S Ominiverse. GPU Ray-Tracing Support to Improve Gaming Realism. Jensen ran an amazing real-time demo of ray-tracing using the newest RTX graphics technology from NVIDIA inside of the Unity Game Engine. In a side by side comparison, he challenged the audience to determine which were real and which were ray-traced scene images. The ray-traced scenes looked better! NVIDIA is releasing this experimental Unity packed in early April. Jensen also announced that NVIDIA will partner with Autodesk and Adobe to include their ray-tracing technology in future software releases. Quake II RTX: Re-Engineering a Classic with Ray Tracing Effects on Vulkan. Quake 2 made NVIDIA and it’s honoring this fun shooter (now an open source game) by updating the graphics to include ray-tracing and physically based materials. Side by side comparisons are jaw dropping. 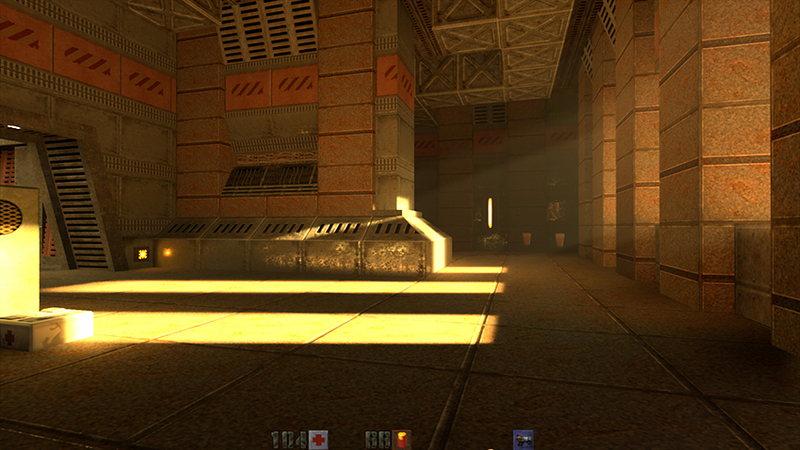 NVIDIA is adding the new code to the Quake 2 open source database soon. NVIDIA Announces Release of New AI Toolkit Called “Clara”. This is a complex subject that is hard to explain. Essentially, NVIDIA recognizes that data analysis relies on latency (the speed of predictions) in order to be effective. They have created a group of tools that have pre-trained data models to make data analysis easier. Their demo was reducing data analysis on a specific top (where to put wifi-hotspots) from 8 days to 4 minutes. Yes, that was not a misprint. Think of a company that has to analyze huge amounts of data very quickly. NVIDIA’s Clara will help them do that. The big takeaway for me was two-fold: one, that the new occupation of “data scientist” is going to very, very important. Jensen mentioned that NVIDIA trained 100,000 people as data scientists last year (2018) and it’s an occuption-track that has huge waiting lists at University. As deep learning data analysis makes it was from science to enterprise business, the need for the data scientist will continue to grow in the near future. Two, NVIDIA graphics technology is based on the idea that computers need to be software defined in order to work quickly and produce quality. Accelerated computing will be based on computer graphics technology whether it’s an artist or a scientist using the machine. NVIDIA’S goals are to meet the needs of new technologies like AR/VR, deep learning and artificial intelligence by developing accelerated graphics computing. The demand for NVIDIA’S technology is increasing year by year and based on what I’ve seen today, they will be leading the way. Everything from movie fx, digital arts, game technology, virtual workplaces, autonomous cars, and medicine will benefit. Practically every major computer graphics site on the web will have extensive coverage of Jensen Huang’s keynote address and the new technologies he announced. I’d start at the main NVIDIA GTC website and NVIDIA’S YouTube channel for the most accurate information. And try to catch the entire keynote if you can as Jensen is a marvelous explainer and has a great sense of humor. We will be posting some of the videos as they are released.